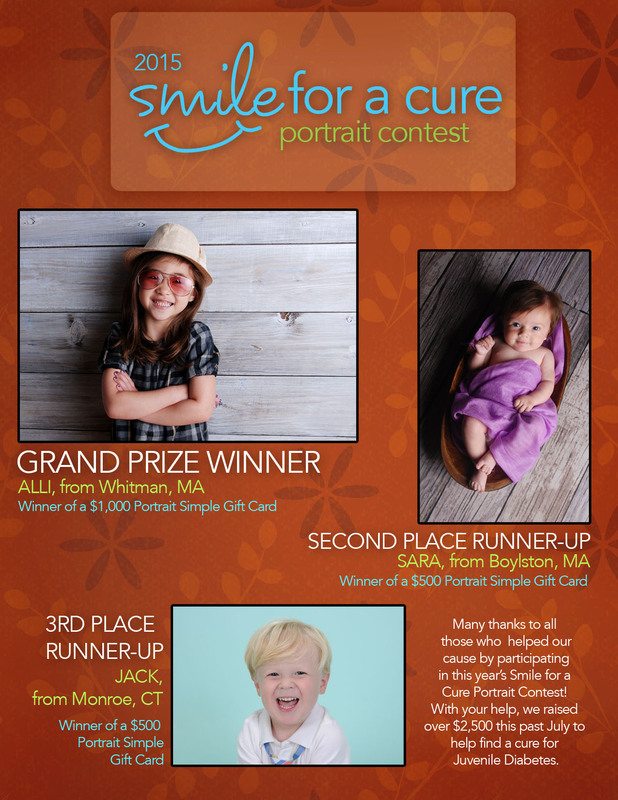 Smile for a Cure Portrait Contest: 2014 Finalists! Each summer, we run an annual portrait contest called Smile for a Cure to benefit the Juvenile Diabetes Research Foundation. For a $10 donation, you get a free 5×7 and a chance to enter your child’s portrait in one of the 3 age groups in our contest (babies, toddlers, and big kids). Our judges have selected the top image per studio in each category, totaling in 21 finalists. All will receive a gift card to Portrait Simple for at least $100. If they make it to the top 3, they’ll win a $500 or $1,000 gift card instead! The Grand Prize Winner will also receive a feature shoot with baystateparent Magazine! Now it’s up to YOU to select the final three! Online voting is open now through Monday, September 29. Once voting is closed, and the top three are determined, the panel of judges will rank them, choosing a first and second runner up, as well as a Grand Prize Winner. Please click your favorite image below in each category (don’t forget to click ‘VOTE’ at the bottom of each category.) Thank you for all your support and best of luck to all our finalists!!!! Categories: What's New | Tags: JDRF, portrait contest, smile for a cure | Permalink. Every July, we run an annual portrait contest called Smile for a Cure to benefit the Juvenile Diabetes Research Foundation. For a $10 donation, you get a free 5×7 and a chance to enter your child’s portrait in one of the 3 age groups in our contest (babies, toddlers, and big kids). Our judges will select the top image per studio in each category, totaling in 21 finalists. All finalists will receive a gift card to Portrait Simple for at $100… If they make it to the top 3, they’ll win a $500 (runner up) or $1,000 (first place/grand price) gift card instead. The Grand Prize Winner will also receive a feature photo shoot for baystateparent Magazine! The runner ups and Grand Prize winners will be selected by YOU, so check back next month for our link to view the finalists and vote online. Please enter our 9th annual contest for this very important cause. We’re accepting entries through the end of July. Call to book your portrait session today! Categories: What's New | Tags: smile for a cure | Permalink. 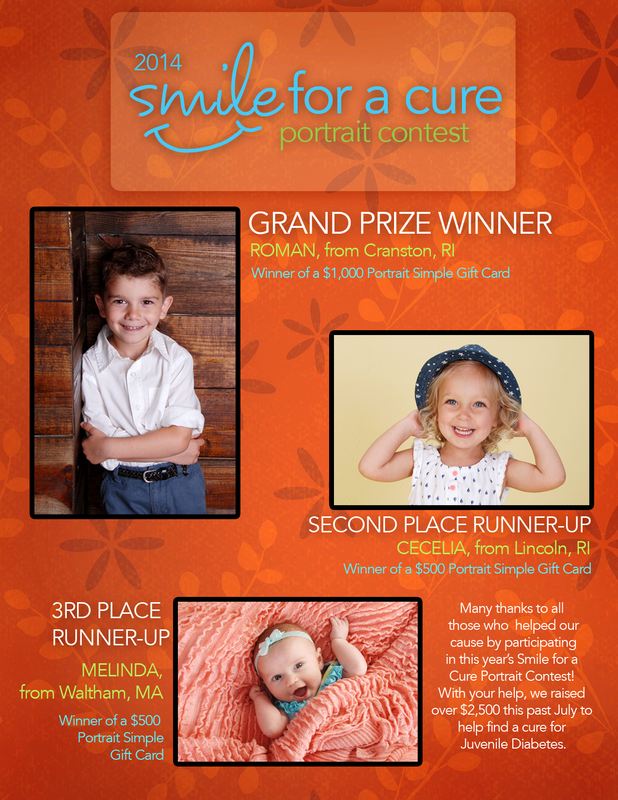 The votes have been tallied for this year’s Smile for a Cure Portrait Contest. Congratulations to ALL of our winners! Categories: What's New | Tags: contests, JDRF, news, smile for a cure | Permalink.